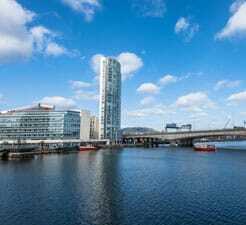 Use Direct Ferries to compare and book your Ferry to Belfast in Northern Ireland to get the best deal. Our comparison tool allows you to view Belfast timetables and ferry prices on all possible routes removing the need to check numerous other websites. All you need to is pick the departure port for your ferry to Belfast, select the number of people travelling on this journey and search! Clean well- run ships that are always punctual. Pricey for a 2-hour journey. Great trip, would reccommend getting a cabin if you have kids as the trip is really long, great cinema and food, staff were lovely and very friendly. The ship was very clean and boarding on and of was easy and well thought. Great trip. "A long weekend, motorcycling in Ireland." A most enjoyable trip. The crossings were both slick, and on time. The ports' staff and those on the ferries were excellent. My motorcycle was well cared for, and I am happy to recommend Stena to any other motorcyclists.